It is not often that I am home for Valentine's Day as I am usually traveling for business. But for a second year in a row, I will be home. How nice! Although I love to go out for dinner, I prefer to eat in and cook a fantastic dinner on Valentine's Day. ( Same thing goes for New Year's Eve.) My dinner last year was soooo good, I am doing the same menu again this year - Osso Buco with Mushroom Risotto followed with Chocolate Lava Cakes for dessert. Osso Buco is made with veal shanks which are cooked for several hours in the oven. Make sure to order the shanks in advance as they are not always available. For a video about how to make Osso Buco click here and for the recipe click here. 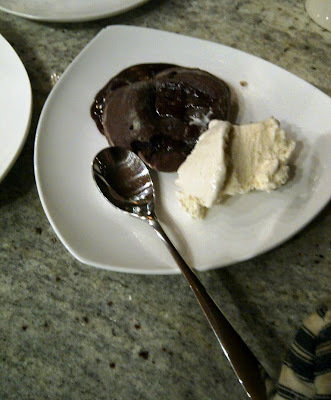 The best part of this meal is the dessert - warm, oozing Chocolate Lava Cakes. They are quick and easy to make but look very impressive. I use Trish Magwood's recipe and it is delish! She serves it with carmel sauce but I serve it with Haagan dazs vanilla bean ice cream as I love the warm cake with the cold ice cream. 1 pint fresh raspberries for garnish. Butter and lightly flour 6 -6oz (175mL) ramekins. Tap out the excess flour. Set the ramekins on a baking sheet. In a double boiler, over simmering water, melt the butter and the chocolate. Whisk until smooth. In a medium heatproof bowl, beat eggs and egg yolks with sugar, and salt until pale yellow and light. Quickly fold the melted chocolate mixture into the eggs. Spoon about 1/3 cup of batter into each ramekin. Bake for 10-12 minutes, or until the sides of the cakes are set and the centers are still soft. Let the cakes cool in the ramekins for 1 minute and then invert them onto dessert plates. Let ramekins stand for 10 seconds before lifting them off the cakes. Serve immediately. And of course dinner wouldn't be complete without Champagne, preferably pink! TELL YOUR HUBBY TO TAKE YOU OUT!!!!! !